Members of the youth alcohol strategy plan. In partnership with other agencies, the City is aiming to reduce alcohol-related harm and the effects of alcohol misuse within the community, particularly in young people. The plan will be rolled out over three years. Mandurah Mayor Marina Vergone spoke about the effect alcohol consumption has on the community. “Alcohol consumption by young people is a concerning issue that needs to be tackled from many angles to keep local youth safe,” she said. “The Our Mandurah Youth Alcohol Strategy provides an important framework to assist in the reduction of underage drinking, promotion of alcohol-free events and to increase harm-reduction messages within our community. Other speakers at the event included Professor John Toumbourou from Deakin University, and Students Advising Youth Project 2015 winners Jessica Kerr and Tequita Macdonald. 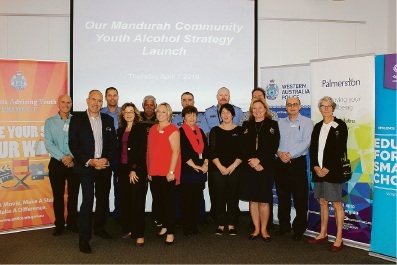 The Strategy is a partnership between the City of Mandurah (Youth Development and Community Safety), School Drug Education and Road Aware (SDERA), WA Police, Palmerston Inc. and the South Metropolitan Population Health Unit.